1 dora the explorer pinata. Your child’s next birthday party will be full of adventure with our Dora the Explorer Pull String Pinata. In this twist on the classic pinata game, guests takes turns pulling one of the 12 pull strings until someone finds the string that releases the goodies. This pinata can be filled with up to 2 pounds of your own party favors and candy (sold separately). This adorable life-size pinata is in the shape of Dora on a multi colored background and is also a fun party decoration for your Dora the Explorer themed party. Coordinate this party game with other Dora the Explorer party supplies and matching solid color party decorations from Unique. 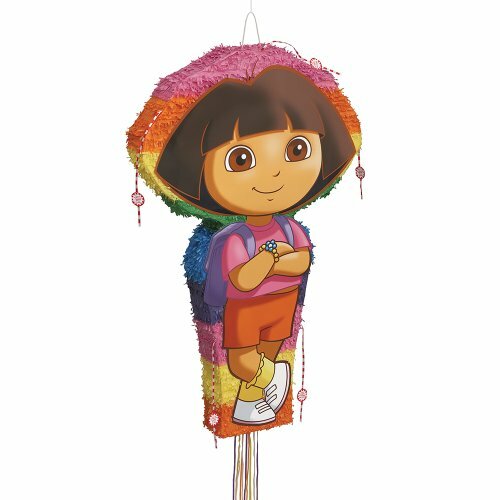 Dora the Explorer Pinata measures 40″ H x 25″ W.